One of the trademarks of Nicolai Hartmann’s ontology is his theory of levels of reality. Hartmann drew from many sources to develop his version of the theory. His essay “Die Anfänge des Schichtungsgedankens in der alten Philosophie” (1943) testifies of the fact that he drew from Plato, Aristotle, and Plotinus. 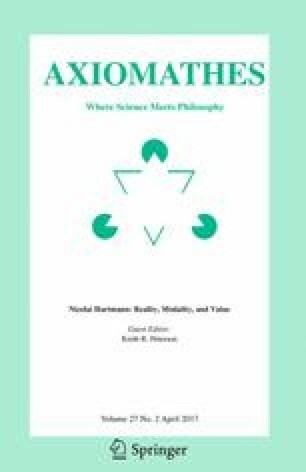 But this text was written relatively late in Hartmann’s career, which suggests that his interest in the theories of levels of the ancients may have been retrospective. In “Nicolai Hartmann und seine Zeitgenossen,” Martin Morgenstern puts the emphasis on contemporaries of Hartmann: Émile Boutroux, Max Scheler, Heinrich Rickert, Karl Jaspers, and Arnold Gehlen. But there is another plausible source for Hartmann’s conception of levels that has so far remained overlooked in the literature. Hartmann studied with and was influenced by Nikolai Lossky. Lossky has a theory of levels that he adopted from Vladimir Solovyov. Solovyov presents his theory of levels, among other places, in Oпpaвдaнie дoбpa (Justification of the Good) (1897), where he says that the five principal stages of the cosmogonic process of ascension toward universal perfection, which are given in experience, are the mineral or inorganic realm, the vegetal realm, the animal realm, the realm of natural humanity, and the realm of spiritual or divine humanity. This theory appears to bear significant similarities with the theory of levels of reality that Hartmann will develop a few decades later. Solovyov was widely read in Russia and it would be unlikely that Hartmann was not at least minimally acquainted with his work. Chances are that Hartmann came into contact with it in some details. An intellectual lineage could thus likely be traced from Hartmann back to Solovyov. In this paper, I document and discuss this possible lineage.